This reading activity gives kids practise supporting inferences with evidence. Here's a worksheet that's great for improving reading comprehension skills. Kids read a simple story about a girl and her kitten then answer the question below. Your students will need to read between the lines as they make inferences about the various scenes included in this reading exercise. Making inferences is a critical skill for young readers to master, as it helps them look beyond the words on the page to figure out the author's message. Use these simple sentences to get your students started in making their own inferences! Use these task cards with your students to practise reading short passages and making inferences about character, setting, and plot. 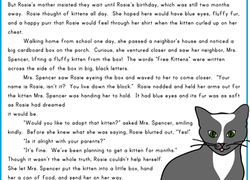 Help young readers make inferences using context clues with this worksheet. Little brothers and sisters can be annoying sometimes, but that's never an excuse to waste a perfectly good cupcake. Making Inferences: Where Are They? This reading resource gives your students practise using text clues and background knowledge to make inferences about characters. Can You Make an Inference? Use this resource to practise using context clues and background knowledge to make inferences about short reading passages. Students will make inferences about feelings and perspectives in a short text. Students will use a word bank and sentence frames to think about what motivates people. This fun resource will strengthen students’ emotional intelligence as they use images to make inferences, a skill which contributes to improved reading comprehension. A key component of reading comprehension is being able to draw conclusions—or make inferences—about what we read. Use this resource to give your students extra practise making their own inferences based on simple sentences. A picture is worth a thousand words. Challenge your student to make inferences by choosing a caption that best fits the illustrations on this worksheet. Learn more about one of the most famous characters in children's literature, The Wizard of Oz, in this character analysis sheet. Your students will use their imaginations to gain understanding of inference, evidence, and schema with this activity. Use this worksheet as an introduction to the vocabulary in the Inferring With Pictures lesson plan. This graphic organizer will encourage your students to put together all the pieces of a strong inference and help them practise reading comprehension skills. Have your child read these Peter Pan passages and decide what she knows about the Peter Pan character. Your students will use their imaginations and context clues to gain understanding of inference, evidence, and schema with this activity. Use this worksheet as an introduction to the vocabulary in the Inferring With Pictures lesson plan.